On Monday my nephew and I successfully completed our challenge to walk the length of the South Downs Way – 100 miles from Winchester to Eastbourne. We had a wonderful time. We encountered wind and rain, beautiful sunshine and for two of the nine days, temperatures which must have been close to 30C. A bit too hot for walking but we had to keep going, and keep going we did. In the process we managed to raise nearly £5,000 including Gift Aid for our chosen cause. The St Peter Project – a new church hall for Fishbourne. The scenery along the trail was very special and there were plenty of opportunities to press the shutter on my Olympus OM EM5. I only took two lenses; the Panasonic f2.8 12 to 35mm zoom lens, together with it’s sister the f2.8 35 to 100mm. I wanted to travel light, so this combination would cover most situations. Many of the photographs taken were more record shots than images which might stand out from the crowd. So now the fun begins to go through several hundred RAW files and begin the editing process. It will take a little time and I do want there to be some order to their inclusion on this blog, whether by type or in chronological order, I have yet to decide. By way of a taster here is one shot which perhaps typifies the scenery and the beautiful weather we enjoyed for much of the time. 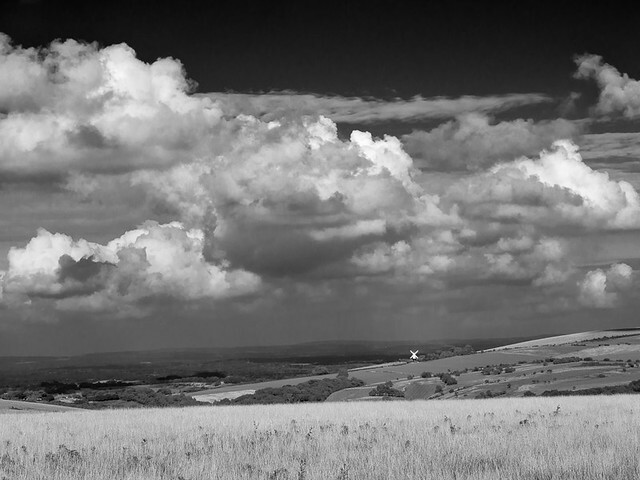 The above image was taken from West Hill to the north of Brighton before we descended into the village of Pyecombe. The windmill you can see is called ‘Jill’, and is one of a pair, the other being called ‘Jack’; they are a well known landmark on the South Downs. The clouds were just stunning and the afternoon sun fell on ‘Jill’ and lit up its sails, so it shone like a beacon against the distant hills in the background. I am so looking forward to processing more images and when I have, I hope they will provide a useful source of material for a number of forthcoming entries on this blog. The Gate – processing a digital painting?